Cortijo la tenada is a rural eco-friendly house split into comfortable and peaceful fully-equipped apartments. 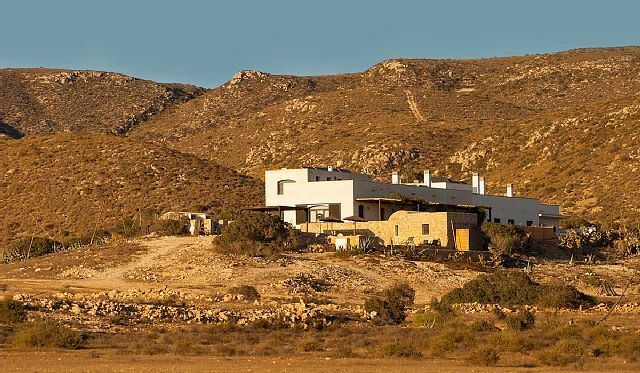 El Cortijo was restored in 2010 following the principles of bio-climatic architecture and using environmentally friendly materials. The hot water and underfloor heating are powered by solar panels. The water from the shower is purified and used to irrigate the garden. El Cortijo is located in the heart of the Cabo de Gata- Nijar Natural Park, Andalusia, a 15 minutes drive from beautiful unspoilt beaches. This is a very special place, nestled in a landscape characterised by gentle slopes and hills dyed in warm earth colours with soft green vegetation. Here everything is quiet, calm and peaceful, but also breathes energy and life. Apartment Olivo for 2 people + 2 on a sofa bed. There is 1 double bedroom, 1 bathroom, a kitchen and a large shady terrace. Apartment Lentisco for 4 people + 2 on a sofa bed. There are 2 double bedrooms, 2 bathrooms, a kitchen and a large shady terrace. Included: - Fully equipped kitchen - The master bedroom can either have with two single beds or one double bed. - Double sofa-bed - Table and chairs for the terrace - In winter, solar underfloor heating - Laundry service - Extra bed available - Baby equipment: cot, highchair and baby bath. Communal Areas: - Garden - The Tenada, a large terrace with deckchairs - Parking Conditions: - A 30% advance of the total amount is needed to confirm the reservation (min. 100€), final payment when receiving the keys. - Check in at 4pm – Check out at 11am. - Smoking is not allowed in the rooms. - The price includes sheets and towels in all the lodgings and a refurnishment every 7 nights. - You can pay for extra cleaning during the stay. - In case of cancellation of the booking, we refund 100% of the amount paid when you contact at least 15 days before the date of entry. Natural air conditioning: The house hasn't air conditioning, the walls of earth and hemp are very insulating and they delay the entrance of the heat in summer and the exit of the same one in winter. On July and August the house maintains a temperature of 26-28 degrees when the outside can reach 34 degrees. At night the temperature usually drops about 8-10 degrees, cross ventilation significantly improves comfort inside the house reducing the temperature by 1 or 2 degrees. My husband and I visited Cortijo La Tenada for two nights during a 10-day trip to Spain, on the recommendation of other hosts. We didn't quite know what to expect from the surroundings or the accommodations themselves, but both turned out to be very special. Cabo de Gata, the park in which the lodge is situated, looks almost like the American Southwest - hills covered in scrubby plants and cactus, enormous sky with every possible intricate combination of clouds. When we stepped outside our suite, you could see other buildings off in the distance - not even that far away, maybe - but the whole atmosphere was one of extreme quiet and calm. There's just nothing around, and it was incredible! The lodge is stark white with dark wood trim, and our rooms were very well outfitted, in a modern, minimalist kind of way. The bedroom got REALLY dark with the shutters closed, which was great for sleeping in - there was absolutely no way to tell what time it was! No lights coming from neighboring buildings to disturb your slumber, of course. Umberto and his wife were very kind hosts who gave us a lot of information about the area and recommended beaches nearby (including Playa de los Muertos, which was beautiful) and towns to eat in. They weren't around very often, but were completely helpful when we needed them. All in all, it was a very pleasant stay and we would certainly go back. Ideal para visitar el Parque Natural del Cabo de Gata. Apartamento con todo lo necesario, limpio y espacioso, perfecto. Totalmente recomendable, un trato excelente por parte de los propietarios Umberto y Almudena. Desde que abandonas la carretera para acercarte al cortijo te metes en el ambiente de tranquilidad que luego se confirma al llegar donde te reciben con mucha amabilidad. Paisajes preciosos al atardecer ,entorno que invita al relajarte y disfrutar de la naturaleza. Excursiones cortas porque todo está muy cerca ,lo que te permite ver mucho en poco tiempo y volver luego a una casa totalmente equipada. Inolvidable experiencia familiar y al marcharte no dejas a un propietario sino que él y su familia ya son tus amigos. Lo hemos recomendado a todos nuestros amigos. El pasado agosto, mi pareja y yo nos alojamos en el cortijo La Tenada y acertamos de pleno. Está situado en el centro del Parque Natural de Cabo de Gata, sin ninguna otra edificación alrededor. Si lo que buscas es belleza, paz, tranquilidad y comodidad, éste es vuestro sitio. Totalmente recomendable. Nosotros estuvimos en el apartamento para dos situado en la planta superior del cortijo. Estaba totalmente equipado, muy limpio y con una gran terraza donde teníamos unas vistas inmejorables de 360º al parque natural de Cabo de Gata. Los anfitriones son encantadores. Nos aconsejaron qué playas visitar, qué rutas hacer y dónde comer. Sin duda volveremos. Nos encantó!!! Alojamiento perfecto, en pleno campo y bien comunicado. Hemos estado una semana, una familia con abuela (con dificultades para moverse) y niña. El alojamiento es muy cómodo y bonito. Puedes disfrutar de estar en pleno campo y a la vez bien comunicado para visitar todo Cabo de Gata. El trato de los propietarios es excelente. Muy muy recomendable. Siamo giunti al “la Tenada” dopo un’intensa settimana di turismo culturale tra Figueres, Barcellona e Madrid che ci ha messo a dura prova . Abbiamo trovato quello che speravamo: un contesto unico inserito in un paesaggio spettacolare e nella calma assoluta. A ridosso del suggestivo Desierto de Tabernas, il parco del Cabo de Gata è un tratto di costa straordinario e quasi intatto. Una settimana è davvero poco per godere di tutte le spiagge, del calore degli spagnoli che ti accolgono nei localini dei paesini lungo la costa dove tutto è a misura d’uomo.